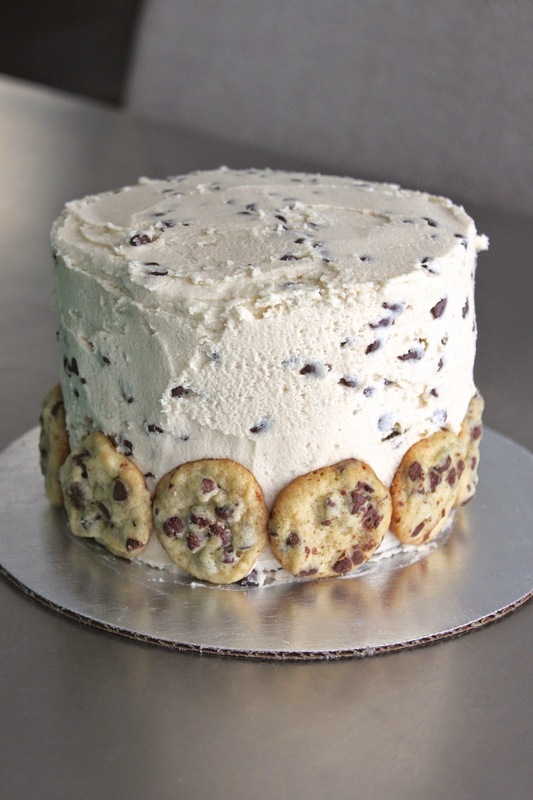 Cookies and Cake together - perfect harmony. I sometimes believe there is no more perfect a desert than a good chocolate chip cookie. My husband and I tend to think I make the best in the world, but I know there are thousands of good recipes out there. A couple years ago I made brown sugar cupcakes with cookie dough frosting and learned it was the perfect marriage of a cookie and a cake. This is honestly my favorite frosting and cake. The original post can be found here and here is a link to miniature chocolate chip cookies.. Cupcakes are always fun, but sometimes when I have extra batter I use it to make a small cake as I did here. I do not make many cakes and really think I should make more. This one is delicious! Preheat oven to 350 degrees Fahrenheit . In a bowl, combine flour, baking soda and salt, stirring to mix. Set aside. Grease and flour two five in cake rounds. Distribute batter evenly into two cake rounds. Bake for 18-20 minutes, or until tops are puffy and golden, and will not jiggle when touched. Let cool completely before frosting. In a medium bowl, beat together the butter, salt, and sugars until smooth and creamy. Beat in the flour and vanilla until well combined. Add milk to reach desired consistency. Stir in chocolate chips or use as garnish. Frost cake as desired. Frosting recipes can be doubled if you like your frosting thick.